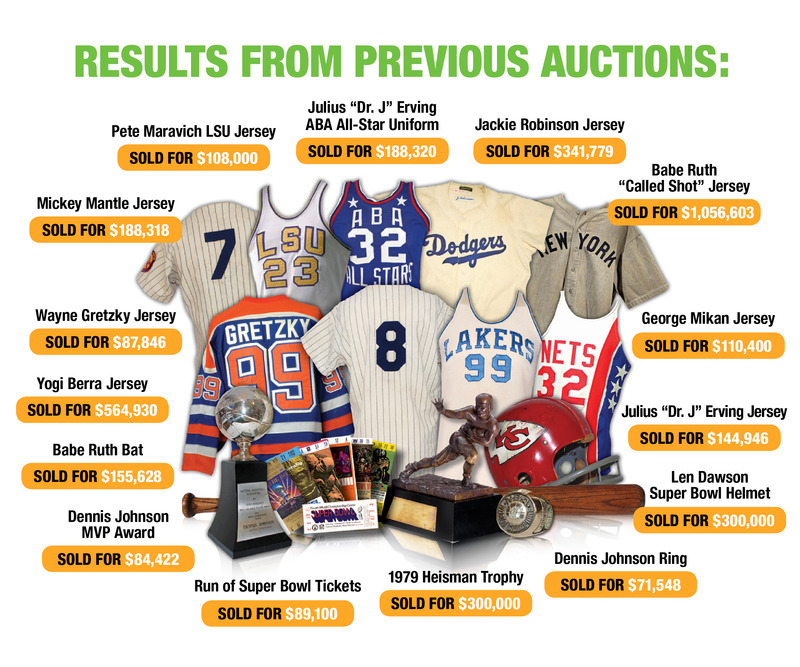 A look back at some of the great memorabilia that was sold by Grey Flannel Auctions. While the list of possible anecdotes is endless, it is impossible to accurately portray on paper the legend that is Babe Ruth. The ultimate embodiment of the American dream, this saloon keeper’s son went from reform school to icon of the first order and in the process changed forever our national pastime. A short recap of the 1932 season, the year to which this uniform dates, is surely in order. Playing in 133 games of the 1932 season, Ruth compiled an impressive .341 batting average and for the eleventh time in his career surpassed the 40 home mark. He placed in the highest percentiles of no fewer than ten prominent statistical categories including homeruns, batting average, runs, on base percentage, and total bases. For the seventh time as a member of the New York Yankees he took the team to the World Series and summarily led them to a World Championship. His batting average of .333 in that Fall Classic can only be overshadowed by the legendary “called shot” in Game 3. After having already hit a home run earlier in Game 3 of the 1932 World Series, Ruth came to the plate in the fifth inning to face Cubs pitcher Charlie Root. Amidst the jeers of the crowd and a count of two and two, Ruth allegedly stepped out of the batter’s box and pointed to the centerfield stands, “calling his shot.” On the next pitch, Ruth slammed a home run into the bleachers, directly above the spot he had purportedly indicated. The world may never know if he really called his shot, but the legend remains one of the most famous moments in baseball history during the game’s “golden age.” The uniform offered herein represents the only completely original, unaltered example of a Ruth jersey ever brought to public auction. Originally obtained 15 years ago by one of the founding partners of Grey Flannel who accompanied an older lady on the west coast of Florida to a safety deposit box where it had been stored for years. An avid golfer, Ruth spent much time on the links and this uniform was given by the Babe to this lady’s father after losing a round of golf to him. This jersey will come with several LOAs. Every expert is in agreement that this jersey is authentic and 100% original in every respect. The majority of these experts deem this to be the “called shot” jersey. Not one of these experts can definitively say that it is not Babe Ruth’s 1932 World Series jersey. An informative package detailing our photographic research and empirical evidence is available to qualified bidders and the media upon request. Mark Okkonen, author of the definitive book on baseball uniforms, states, “Based on the photo evidence you provided, I have every reason to believe the Babe Ruth road jersey in your possession does indeed represent the 1932 season and had to have been worn by the Bambino when he connected with his famous “called shot” home run in the 1932 World Series at Chicago. To the best of my knowledge the team did not issue a second set of road uniforms and the very subtle differences in the placement and configuration of the “NEW YORK” letters match the photographs provided. If I were in a position to purchase this item with the provenance claimed for it I would not hesitate a minute. Although there appears to be no such thing as 100% proof, it certainly seems impossible that anyone could prove this was not the jersey worn on this historic occasion based on the photos you have found to support this claim. It looks like you have a “slam dunk” on this one!” Based on a most stringent examination of photographic evidence, the jersey appears to replicate the unique idiosyncrasies of all known 1932 road jerseys. 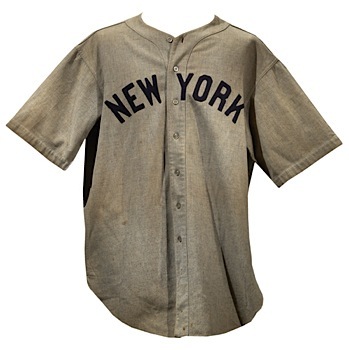 The position of “New York” across the front of this Ruthian-sized road jersey matches the known 1932 positioning. Group and individual photos of the 1932 Yankees show the same positioning of the “New York” block letters in relation to the buttons. The spacing and the style of the letters is consistent across all the 1932 road jerseys. Further, the curvature of the “W,” the skew of the “E” and the positioning of the “Y” on this jersey in most experts’ opinions matches known photos of Ruth in the 1932 World Series, and differs from other examples of known Yankee road jerseys. In the collar is the player name “Ruth G.H.” in red chain stitch which also appears to match a known 1932 home Ruth jersey. Also present is the “A.G. Spalding” manufacturer’s label. Across the front of the jersey is the team name “New York” and on the back is a matching player number “3.” Both the letters and numbers are done in blue felt. A small sewing imperfection can be found on the back number, only mentioned to avoid inaccuracy. In the back tail is remnant of the so-called “fat strap” used by Ruth to insure that the jersey remained tucked in, necessitated by his girth at that point. It was a long length of material that Ruth would draw up between his legs and tie into two custom buttonholes, which are present at front bottom. There is a small hole on the left rear shoulder which occurred a few years ago during the handling of the jersey. The flannel shows perfectly fitting use throughout and is in a remarkable state of preservation. He was basketball’s unstoppable force, the most awesome offensive force the game has ever seen. Asked to name the greatest players ever to play basketball, most fans and aficionados would put Wilt Chamberlain at or near the top of the list. Dominating the game as few players in any sport ever have, Chamberlain seemed capable of scoring and rebounding at will, despite the double- and triple-teams and constant fouling tactics that opposing teams used to try to shut him down. As Oscar Robertson put it in the Philadelphia Daily News when asked whether Chamberlain was the best ever, “The books don’t lie.” The record books are indeed heavy with Chamberlain’s accomplishments. He was the only NBA player to score 4,000 points in a season. He set NBA single-game records for most points (100), most consecutive field goals (18) and most rebounds (55). Perhaps his most mind-boggling stat was the 50.4 points per game he averaged during the 1961-62 season–and if not that, then perhaps the 48.5 minutes per game he averaged that same year. He retired as the all-time in career points with 31,419, which was later surpassed by Kareem Abdul-Jabbar, Karl Malone and Michael Jordan. He is tops in rebounds with 23,924. He led the NBA in scoring seven years in a row. He was the league’s top rebounder in 11 of his 14 seasons. And as if to prove that he was not a selfish player, he had the NBA’s highest assist total in 1967-68. He was elected to the Basketball Hall of Fame in 1979. Top 50 All-Time player. On the front center tail of this magnificent jersey is the “Tiernan” manufacturer’s tag. Across the front of the jersey is “WEST” done in purple on white tackle twill. Below that and on the back is the player number “13” in white on purple tackle twill. Across the back of the jersey is the player name “CHAMBERLAIN” in purple on white tackle twill. There are four purple star tackle twill patches on the front of the jersey in the four corners. In the back waistband of the shorts is the “Tiernan” manufacturer’s tag. There are four white on yellow tackle twill star patches on the side of the shorts. The uniform shows game-use and appears to have no alterations of any kind. It is accompanied by a detailed letter of provenance from our consignor who was a personal friend of Wilt’s which states, in part, “…I stopped by the locker room before the game and asked Wilt if I could have his jersey after the game to which he replied “No Problem, my man…he sent it back in a sweat soaked brown paper bag…” This treasure of basketball history was also on display at Murphys Bleachers next to Wrigley Field in Chicago from 1988 to 2007. It is also accompanied by the book “WILT LARGER THAN LIFE” which mentions our consignor and the beginnings of his life-long friendship with Wilt. The Green Bay Packers opened the Super Bowl series by defeating the AFL champion Kansas City Chiefs behind the passing of Bart Starr, the receiving of Max McGee, and a key interception by All-Pro safety Willie Wood. Green Bay broke open the game with three second-half touchdowns, the first of which was set up by Wood’s 50-yard interception return. McGee, filling in for an ailing Boyd Dowler after having caught only four passes all season, caught seven from Starr for 138 yards and two touchdowns. Elijah Pitts ran for two other scores. The Chiefs’ 10 points came in the second quarter, the only touchdown on a 7-yard pass from Len Dawson to Curtis McClinton. Protected by Steve Wright and the Packers offensive line, Starr completed 16 of 23 passes for 250 yards and two touchdowns and was chosen the MVP of the first Super Bowl. This size 13.5, 14k gold players ring weighs 40 grams. 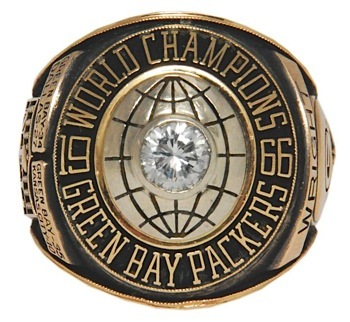 The top panel reads “WORLD CHAMPIONS 1966 GREEN BAY PACKERS” surrounding a large 1-carat full-cut diamond on a white gold globe. The left panel displays two banners engraved with the final scores of the Conference Championship and Super Bowl I. The left banner reads “GREEN BAY 34 – DALLAS 27”, the right banner reads “GREEN BAY 35 – KANSAS CITY 10”. Below that is a casted image of the NFL shield that incorporates the AFL logo and a casted image of a crown with “HARMONY, COURAGE, VALOR” engraved. The right panel displays a banner engraved with the player name “WRIGHT” above a casted image of a Packers helmet with “1965-1966” engraved. Below that is a casted image of a football with the player number “72” engraved. The inside of the ring is stamped by the manufacturer “JOSTENS 14K”. The ring is in NRMT overall condition and comes in the original wooden presentation box. The presentation box has a plaque which reads “DESIGNED EXPRESSLY FOR STEVE WRIGHT – GREEN BAY PACKERS WORLD FOOTBALL CHAMPIONS 1966”. This is the only original Super Bowl I players ring ever to be offered publicly. The ring is accompanied by a LOA from Steve Wright. This is the nicest 1930 NY Yankees team baseball that we have ever handled. OAL Barnard red and blue stitched baseball signed by 25 members of the 1930 NY Yankees including a gorgeous Babe Ruth on the sweet spot rating an 8-9 and Lou Gehrig directly to the left of Ruth on the west panel rating an 8-9. Other signatures include Tony Lazzeri, Earle Combs, Bob Shawkey, Bill Dickey, Chas Ruffing, Chas O’Leary (coach), Lyn Lary, Bennie Bengough, Art Jorgens, Hank Johnson, Ben Chapman, Harry Rice, Ed Wells (faded), George Pipgras, Ken Holloway, Sam Byrd, Herb Pennock (faded), Jimmie Reese, Lou McEvoy, Ownie Carroll, Dusty Cooke, Bubbles Hargrave and Art Fletcher (coach). All signatures are done in black steel tip fountain pen and rate an overall 8-9. The ball is absolutely gorgeous, white with the slightest of toning/spotting. Jimmy Spence of JSA told us that this is the nicest 1930 NY Yankees team signed ball he has ever seen and is far nicer than any exemplars in his data base. Accompanied by a full LOA from JSA. 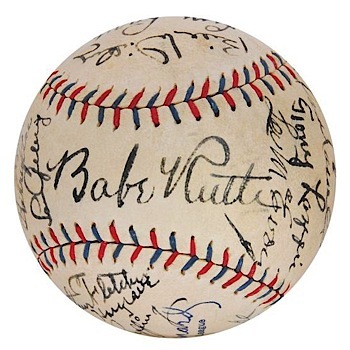 It is further accompanied by a LOA from our consignor which states, in part, “Years ago, my grandmother worked for Miss Winnie Wyant (companion of Col. Jacob Ruppert, owner of the Yankees)…at some point, Winnie gifted these two baseballs (also the lot number 4 in this auction). She explained that Ruppert would visit the Yankees clubhouse and ask the players to sign baseballs to give to friends”. Originally sourced from Jacob Ruppert, nothing short of phenomenal. One of the earliest known Spalding football jerseys from a major college. Princeton was a national powerhouse during the 1890’s and turn of the century. 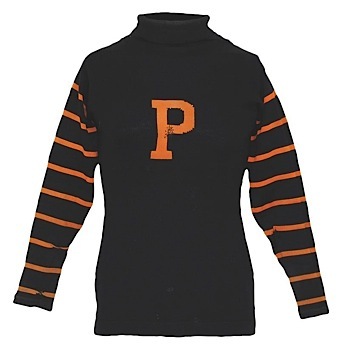 The wool turtleneck features the famous Princeton orange sleeve stripes as well as the Princeton “P” sewn into the front center of the sweater. The Spalding label has been sewn inside the back tail and this is one of the oldest Spalding labels that this Auction House has ever seen. A multitude of team repairs are sewn throughout the sweater. This is from the same styling period of the famous “Poe Brothers”. There were six Poe brothers who attended Princeton. The most famous being Edgar Allen Poe who was the captain and quarterback of the team in his junior and senior year; 1891 and 1892. On this page you will find a photo which is a style match of John Prentiss Poe Jr., also you will find a photo of the six Poe brothers all in their various Princeton jerseys. This is indeed a truly historical and important American artifact of the early years of college football and American history. After his retirement in 1999, The Great One was immediately inducted into the Hockey Hall of Fame. The NHL retired his jersey number 99 league-wide, making him the only player to receive this honor. This jersey comes to us directly from Orel Hershiser. As told to us by Orel, he went to a Kings game in Los Angeles in 1989-90 and after the game, visited with Wayne Gretzky in the Kings locker room. Gretzky gave Orel the shirt off his back from that game. What provenance could be better?…from one super star’s hands to another’s. Inside the rear collar is the “Maska Ultrafil” tag with size “54” written in blue ink. Inside the rear right tail is a strip tag with “99” embroidered in black. Adjacent is a Velcro swatch, patented on Gretzky gamers as he tucked one half of his sweater into his pants. On front is the team large embroidered crest with “LOS ANGELES KINGS”. Adjacent on the left chest is the Captain’s “C” done in grey on black tackle twill. Player number “99” appears on the back in grey on black tackle twill and on both sleeves in grey on white tackle twill. 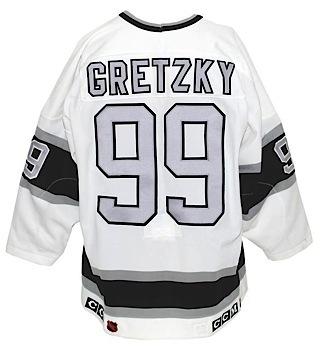 Player name “GRETZKY” appears across the back in grey on black tackle twill on a white nameplate. On both outer rear tails are the “NHL” and “CCM” embroidered logo’s. The jersey is properly tagged, was presented to us as game-used and in our opinion, shows excellent use with stick marks on front. This trophy originates from the personal collection of Dave Cowens. Cowens’ playing credo was all-out intensity at both ends of the court, a style that never wavered during his NBA career. He played 10 seasons for the Boston Celtics, winning two NBA Championships. As a testament to his all-around ability, Cowens is one of only four players to lead his team in all five major statistical categories for a season: points, rebounds, assists, blocks, and steals. During his 1972-73 MVP season, Cowens played in all 82 games. He amassed 1,684 points, 1,329 assists and 333 assists. After his retirement, his number 18 jersey was retired by the Celtics. In 1990, he was elected to the Hall of Fame and was voted one of the NBA 50 greatest players of all time in 1996. This colossal trophy is an extremely rare find to say the least. It stands nearly four feet tall and has a wooden base which measures 15 inches across and deep. From the bottom up, there is a second tier wooden base which has a gold colored basketball player atop a gold colored cup sans two decorative rings. At each corner there is 17-inch gold colored pillar, four in total which support the third tier wooden base. Atop this third tier base are four gold colored basketball players, one at each corner, each measuring 6” tall. At the center is a large 10-inch gold colored trophy atop which sits a 9-inch gold colored basketball player in a hook shot position. At the front of the base is a gold plaque which reads, “PODOLOFF TROPHY 1972-73 NATIONAL BASKETBALL ASSOCIATION MOST VALUABLE PLAYER DAVE COWENS”. This true piece of basketball history is in NM overall condition. It is accompanied by a LOA from Dave Cowens himself. In the history of Major League Baseball, there have been just 17 perfect games. With the most memorable performance in Yankee Stadium history, Don Larsen and his battery mate Yogi Berra combined for the only one ever in a World Series. The setting was Game 5 of the 1956 Fall Classic, a rematch of the ’55 Series between the New York Yankees and the hated Brooklyn Dodgers. With the series knotted at two games apiece and the Yanks hungry to reclaim the title they had lost to the Dodgers the year before, Yogi called the best game of Larsen’s life. Though the game did include defensive heroics—like Mantle’s fifth inning snare in Yankee Stadium’s “Death Valley” left-centerfield gap—Larsen’s sometimes shaky control would not desert him on this day. It took him just 97 pitches to attain perfection, reaching a three ball count just once in the first inning. After the 27th consecutive out, an exuberant Berra charged the mound and lept into Larsen’s arms, creating the “everlasting image” that has been permanently etched in the minds of every Yankee fan since that day. This home pinstripe flannel was worn by Yogi during that game, and the jersey has been photo matched with that iconic image. Inside the back collar is the size “44” flag tag. On the front left tail is the “Spalding” manufacturers tag. Below is “Berra 8 56” in blue chain stitch directly on the jersey. Inside the left front tail is a wash instructions tag with a “Set 1 1956” flag tag. On the left breast is the “NY” interlocking logo in navy blue felt. On back is the player number “8” in the same felt. Inside the back waistband is the “Spalding” manufacturers tag. Attached is a “Set 1 1956” flag tag. To the left is a wash instructions tag. 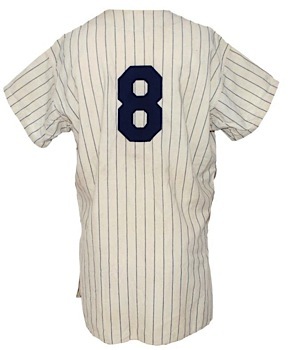 Written in the front waistband is the player number “8” in black marker. Since Berra wore them, the pants have been taken in by our consignor’s mother. The jersey is 100% original and shows game-use and appears to have no alterations of any kind. It comes with a letter from the consignor recalling how the Yankees gave him this jersey in 1959. Nicknamed the “Wizard of Westwood”, he won ten NCAA national championships in a 12-year period — seven in a row — as head coach at UCLA, an unprecedented feat. Within this period, his teams won a record 88 consecutive games. He was named national coach of the year six times. As a player, Wooden was the first to be named basketball All-American three times and he won a national championship at Purdue. Wooden was named a member of the Basketball Hall of Fame as a player (inducted in 1961) and as a coach (in 1973), the first person ever enshrined in both categories. Only Lenny Wilkens and Bill Sharman have since had the same honor. He was one of the most revered coaches and was beloved by his former players, among them Kareem Abdul Jabbar and Bill Walton. Wooden was renowned for his short, simple inspirational messages to his players, including his “Pyramid of Success.” These often were directed at how to be a success in life as well as in basketball. In the back inside collar is the “Sand-Knit” size 44 manufacturers tag. 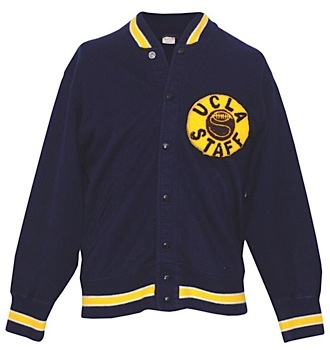 On the front left breast is the “UCLA STAFF” wool patch. Inside the front tail is the “J.WOODEN” chain-stitched felt strip tag. The jacket shows wear and appears to have no alterations of any kind. Included are numerous photo matches throughout his coaching career as well as from his 50th birthday party. The very avatar of sportsmanship in America and the most significant and celebrated trophy in sports, the Heisman Trophy has been awarded annually by the Downtown Athletic Club (DAC) of New York City since 1935 to college football’s most outstanding player. The DAC was a privately owned recreation facility near the site of the former World Trade Center. Following the bankruptcy of the DAC in 2002, the award is now given out by the Yale Club. The trophy is named after one of the greatest innovators of American football, John W. Heisman; no man had a bigger impact on the game before or since. Playing a combination rugby/soccer game in the late 1800s at Brown and Penn, Heisman was debilitated by a lightning strike and nearly lost his eyesight. Upon graduation he turned to coaching football at Oberlin College, who in only their second season in existence went undefeated. Continuing to innovate at Georgia Tech in the mid-to-late 1910s, he is mostly responsible for the game of football that we know and love today; much of the Official Rule Book at the time was written in Heisman’s own words. In fact, he is largely responsible for the legalization of the forward pass in 1906, after his constant badgering of Walter Camp and the rules committee. As the head coach of the Georgia Tech Engineers in 1916, he defeated the Cumberland University Bulldogs 222-0 in the most one-sided college football game ever played, during which the Engineers scored with every possession of the ball. At the end of his enormously successful coaching career, Heisman switched gears and turned to writing about football. Deeply respected in football circles, in 1930 he was named the first Athletic Director of the DAC. Soon thereafter, he founded and organized the Touchdown Club of New York and the National Football Coaches Association. After careful consideration of the suggestions of DAC members, and after initial resistance, Heisman created a system to ascertain the best collegiate football player in the country. Voted on by more than 1,000 sportswriters and announced every December before the postseason bowl games, the Heisman Trophy was thus born. Commissioned to design the trophy was 23 year old New York native Frank Eliscu, who had recently won the National Academy Prize in sculpture. The DAC committee decided that the trophy should be a bronze replica of a football player carrying the ball in his left hand while fending off defenders with his right hand. Eliscu used his good friend and 1934 NYU star player Ed Smith to pose as the model; exaggerating his biceps and calf muscles, Eliscu created a prototype in clay. With the help of Fordham coach Jim Crowley, one of the Four Horseman of Notre Dame, modifications were made and the prototype was converted into a plaster cast, the mold from which the final bronze statues would be made. It is truly a work of art unto itself. The first trophy was awarded to Jay Berwanger of the University of Chicago in 1935. John Heisman died on October 3, 1936, before the second annual Heisman could be awarded; the officers of the DAC unanimously voted to rename the DAC Award to “The Heisman Memorial Trophy” that year. Many of the players have become both household names and Pro Football Hall of Famers, such as Paul Hornung, Marcus Allen, Doak Walker, O.J. Simpson, Tony Dorsett, Earl Campbell, Barry Sanders and Roger Staubach. 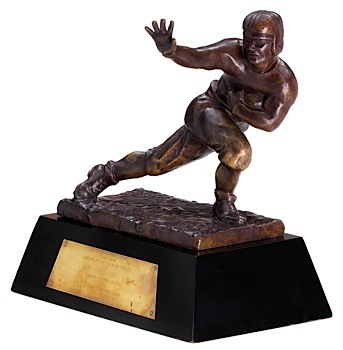 This actual Heisman Trophy was presented to USC Trojans tailback Charles White in 1979. USC shares the honors with Notre Dame for the most Heisman Trophy winners with seven each. White, a major part of USC’s distinguished “Tailback U” era, set 22 records in the NCAA and Pac 10 Conference. He went on to the NFL and played for the Cleveland Browns (1980–1984) and Los Angeles Rams (1985–1988). He was a 1987 Pro Bowl selection after rushing for a league-leading 1,387 yards and 11 touchdowns, earning him the “NFL Comeback Player of the Year Award.” White retired with 3,075 rushing yards and 23 touchdowns, along with 114 receptions, 860 yards and 1 touchdown. A great athlete, he later made an appearance in the American Gladiators TV show’s “Pro Football Challenge of Champions” specials, winning both. Mounted on an approximately 17-1/2″ x 10-1/4 x 5″ tall trapezoidal black lacquered wood pedestal is the magnificent 12″ tall cast bronze player holding a football with arm outstretched, on a 13-1/4″ x 6-1/2″ x 1″ tall pedestal, in total approximately 18″ high. On the front of the pedestal is an approximately 10-1/4″ x 3″ trapezoidal brass plaque that reads “The Heisman Memorial Trophy Is Presented By Downtown Athletic Club Of New York City To Charles White, University Of Southern California, As the Outstanding College Football Player In The United States For 1979.” The trophy is in absolutely fabulous condition and has not been altered or restored in any way, 100% original, no cracks or chips, very light wear on wood pedestal. This is a once in a lifetime opportunity to acquire a true piece of American history. The most significant individual achievement in NBA history occurred on March 2, 1962 when the NY Knicks traveled to Hershey, PA to take on Wilt Chamberlain and the Philadelphia Warriors. During a season in which he would set an NBA record with an unthinkable 50.4 ppg scoring average, basketball fans everywhere wondered what it might be like if Chamberlain were to reach the century mark in a single game. Warriors Coach Frank McGuire was bold enough to predict that Chamberlain was capable of triple digits and it was on that fateful March day that Chamberlain proved him right. Wilt began the game against the Knickerbockers by making his first twelve foul shots; a surprising achievement for a man who only made fifty-one percent of his career free throws; but even more special was the way in which Wilt kept pouring on the points. Twenty-three points in the first quarter and eighteen in the second gave him forty-one at the half, but Wilt picked up the pace with twenty-eight third quarter points to head into the final quarter just short of his two previous NBA scoring records (73 & 78). Chamberlain scored his record seventy-ninth point with 7:51 remaining and has amassed eighty-nine points with five minutes remaining. Though the Knicks attempted to avoid humiliation by using up the 24 second clock on each trip down the floor, McGuire sent substitutes into the game to foul their opponents and regain possession. A Chamberlain dunk with 46 seconds remaining in regulation gave him one hundred points. The crowd immediately rushed onto the court resulting in a five minute delay until order was restored. Wilt “The Stilt” had made history; 100 points in a single NBA game, a record that still stands and that no one has even come close to. Somehow preserved in all this madness was the two-page official scorer’s score sheet, offered here. Point by point and foul by foul, the official scorer constantly updated the sheets as the Warriors and Knicks tallied up the 169-147 final score. Each white sheet measures 11” x 8-1/2” and shows evidence of being removed from a book. Each is filled out in pencil, one sheet per respective team. 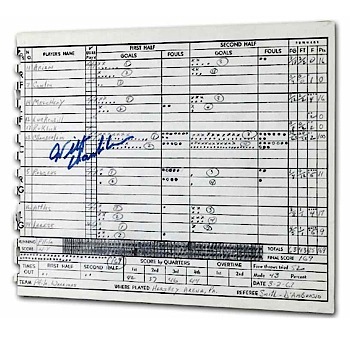 Almost as remarkable as the sheet’s appearance is the bold signature of Chamberlain himself adjacent to his name on the Warriors sheet, added at a later date in blue marker which rates a 9. Also included is an original program from the historic game, “The Wigwam” featuring Chamberlain on the cover in his number “13” Warriors jersey, dated “Friday March 2, 1962”, EX overall condition with light cover creasing; original newspaper box score cut out from the game titled “Wilt’s 100” signed by Chamberlain in blue marker rating a 7-8, NM overall; original “Table-Working Press” ticket that would appear to have belonged to the official scorer and attendee. Written on the ticket is “Wilt’s 100 Pt. Game at Hershey, PA 3-2-62” in blue ink, EX overall with light toning. This is basketball history. Opportunity to own a treasure of this magnitude only comes along once a generation, and here it is. As gigantic as the man himself. Dr. J, Julius Erving is maybe the most spectacular basketballer ever, and one of the best dunkers. He was named to the NBA’s 50th Anniversary All-Time team and in 1993 was inducted into the Basketball Hall of Fame. As his career blossomed early, Erving helped legitimize the American Basketball Association (ABA). Much as some players are considered “the team,” Dr. J was considered “the league.” He was the main asset of the ABA when it merged with the NBA after the 1976 season. The ABA’s final All-Star game that year is generally acknowledged to have been one of the greatest sporting events of its kind. The game was played in Denver and pitted the Denver Nuggets against the best players from around the league. It featured the first halftime slam-dunk contest. For his first dunk, Erving stood underneath the basket and dunked two balls at once. But his second was the one that will always be remembered. One of the contest rules said that a dunk had to be made from a hash mark three feet inside the free throw line. Erving decided to take it an extra step. Three extra steps, to be exact. When Erving jogged to the free-throw line and then began to measure his steps back in long, loping strides, the crowd went into a frenzy, as did the players sitting on the sidelines. “Here was my philosophy — dare to be great,” Erving said. With seven giant strides, one great leap, and one forceful slam, Erving shook the basketball world with his rim-rocking dunk for the ages. This was the very uniform worn by Dr. J that historic night in Denver. It is said to be the precursor of the merge. 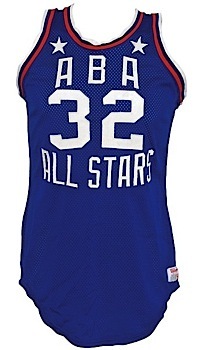 On the left front tail of the jersey is the “Wilson” manufacturers tag with wash instructions and jersey size “44.” On the front is “ABA ALL STARS” and player number “32.” On the back is the player number “32” along with “ERVING.” All numbers and letters are done in white tackle twill. There is a white star on each front shoulder strap. The trim of the jersey is red, white and blue in celebration of the bicentennial. Below the rear inner waist band of the shorts is the “Wilson” manufacturers tag with wash instructions and shorts size “34.” Attached is a flag tag with alterations written in blue ink that have faded. There are two embroidered white stars on the outer left seam. The provenance of this treasure is iron clad. It is accompanied by a LOA from a former Nets ball boy which states the following, in part, “…During training camp in 1975 at the Merchant Marine Academy, I asked Dr. J if I could have his All-Star Game Uniform. The first home game after the All-Star Game, Dr. J. dressed and he called me over. He handed me a bag with his 1976 All-Star Game uniform along with a program which contains several autographs. I have had this as a part of my collection ever since…” In addition to the LOA from the ball boy, it is accompanied by a 1976 All-Star Game program that Dr. J handed him with the uniform which has been signed by many All-Stars. All signatures are done in black marker and rate an overall 9. The program is accompanied by a LOA from JSA. Also accompanied by a 24″ x 36″ poster of Dr. J making his dunk at the 1976 All-Star game wearing this very uniform. It shows game-use and appears to have no alterations of any kind. This is the most important shirt in ABA history! Paul Hornung is one of three players to have won the Heisman Trophy, been selected as first overall National Football League draft picks, and been inducted into both the Pro Football Hall of Fame and College Football Hall of Fame. He is also a member of the 1960’s All-Decade team and the Green Bay Packers Hall of Fame. On the left front tail of this green durene shirt is the “RED FOX” manufacturer’s tag with jersey size “46”. Above is a wash instructions label. Inside the rear collar is a flag tag with size “46”. Player number “5” appears on the front, back and on both sleeves in white tackle twill. Hornung has signed the front in silver marker adding the inscription “5” rating a 7. The jersey is properly tagged, was presented to us as game-used and in our opinion, shows outstanding use with numerous large team repairs. Accompanied by a letter of provenance which states, in part, “In the 1960’s, my father worked the sidelines as a member of the chain crew in the Orange Bowl. 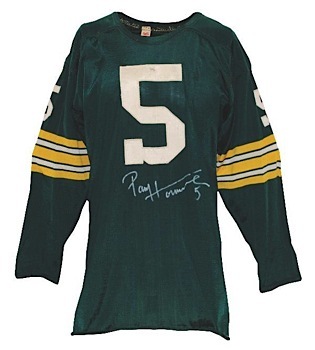 One day he brought me home Paul Hornung’s actual game worn jersey which had been given to him by Packers equipment manager Gerald “Dad” Braisher…the jersey has been in my possession ever since”. Further accompanied by a LOA from JSA as well as a photo of Hornung signing the shirt. For a short period of time in the mid to late 1920s, like a gunslinger out of the Old West, Babe Ruth would mark his kill by carving a notch on his game bat after he blasted a pitch out of the park. While some people through the years have believed this to be an apocryphal tale befitting the Babe’s legend, this item just might be baseball’s answer to the Holy Grail. It’s one of Ruth’s bats used during 1926-29, a 4-season span when he averaged an amazing 51.75 home runs per season. While we don’t know which of those 207 home runs were marked by a notch, it’s possible some may be of the 60 shots he blasted over the wall in 1927, setting a record that stood for over half a century. Profound in any case is the fact that all the notches were part of Ruth’s career total of 714, a number that has become imbedded in American history. Any authentic Ruth bat is a collectors dream. With this bat, one can almost feel the ball exploding off it. This Hillerich and Bradsby bat has the labeling period 1926-29. It is a 36″ in length and weighs today 36 3/4 oz. Both measurements correspond to bats ordered by Ruth during the referenced labeling period. This information has been extracted from Ruth’s Professional Bat Ordering Record on file at Louisville Slugger Inc. 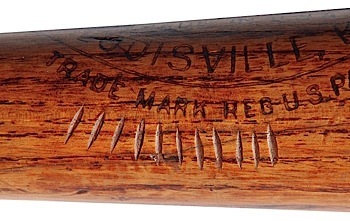 The bat has numerous ball marks with a handle crack. There is grain swelling about the barrel and several bat boy nails on the back. Underneath the center brand are 11 home run notches that have been determined to be original. The handle crack runs through the home run notches. The significance of this crack is vital to proving the home runs took place prior to it being cracked, retired by Ruth and subsequently returned to the factory for duplication. A close examination of the crack and notched area reveals that the crack runs cleanly through the notches. The crack line has no distortion whatsoever. The condition of one notch in particular provides additional evidence that the notches were on the bat when the crack occurred. There is a planed area on the left barrel of the bat indicating the bat was returned to the manufacturer so that other bats of the same model could be ordered. This was common practice during the era. When received Henry Morrow, the pro player representative at then Hillerich & Bradsby Co. would plane a small area on the barrel and inscribe the date received, weight and player name. Faint portions of lettering can still be seen in the side-written area but the player name and other information is illegible. Additionally, faint images of factory notations can be seen on the handle of the bat. The initials “B.R.” have been carved into the knob, most likely to identify the bat once it was placed into the racks after its return to Hillerich & Bradsby Inc. There are only four known documented examples of bats notched by Ruth, to log the number of home runs hit. One of which is on display at the Louisville Slugger Museum in Louisville, KY. It must be noted that the notches on all four of the known notched bats appear to have been made with the same tool. They are the same shape and size. It is believed Ruth used the edge of a file to engrave the bats. Another critical point to the authenticity of the bat is the location of the notches under the center brand matches another of the known and documented notched home run bats. That bat resides in a well-known collection and has 5 notches in the “7 o’clock” position under the center brand and 6 notches at the 2 o’clock position above the center brand. That bat also has factory side writing with Ruth’s name visible in the side written area with a return date of 2-6-29. An important piece of baseball history. The United States had revenge on its mind after the debacle at Munich in the 1972 Summer Games. The ‘76 US basketball team was coached by Dean Smith of the University of North Carolina, and he chose a team heavily laden with players from his own school – Phil Ford, Mitch Kupchak, Tommy LaGarde and Walter Davis, the standout player at UNC. The top two European teams remained the Soviet Union and Yugoslavia, who had finished 1-2 at the 1970 World Championship (the USA was 5th), and the 1969 and 1971 European Championships. The United States almost lost an early round game to Puerto Rico, led by Marquette University star, Butch Lee, but eventually prevailed, 95-94. A rematch of the ‘72 USA-USSR game never occurred after Yugoslavia defeated the Soviet Union in the semi-finals and advanced to the gold medal game against the United States. In the final, the United States scored the first eight points, and was never challenged by Yugoslavia, winning 95-74. 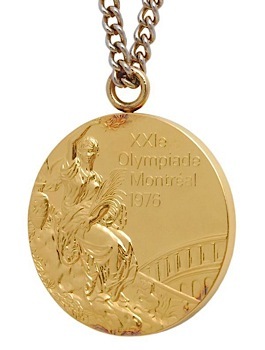 This 1976 Olympic gold medal weighs 5.45 oz. with a 60 mm. diameter and a thickness of .50 cm. The gold-plated medal contains at least six grams of pure gold. It was presented to Walter Davis as a member of the 1976 USA Men’s Basketball team after they defeated Yugoslavia in the gold medal game on July 25, 1976. The face of the medal features a design by Florentine artist Giuseppe Cassioli. Created for the 1928 Olympic Games in Amsterdam, the design was used on all Summer Olympic medals until 2004. It reads, “XXIe Olympiade Montréal 1976”. The verso shows the 1976 Olympic logo and the victor’s laurel wreath (symbol of the ancient Games), rendered in the bold, uncluttered style of the Montreal Games. The bottom edge of the medal is engraved “Basketball”. The medal is in NRMT-MT condition and is accompanied by a LOA from Walter Davis.